Albert Lulushi: Interview with Voice of America Albanian Service about "Operation Valuable Fiend"
Interview with Voice of America Albanian Service about "Operation Valuable Fiend"
At Voice of America studios on November 23, 2013. I visited Voice of America this morning, where I was interviewed about my soon-to-be-published Operation Valuable Fiend, by Rudina Dervishi of the Albanian Service broadcast "Ditari." The entire experience was outstanding. The editor, Ms. Isabela Cocoli, was instrumental in reaching out, coordinating schedules and lining up content for the interview. Ms. Dervishi was an excellent interviewer who put me at ease in front of the camera, asked thoughtful questions focusing on the heart of the matter and moved the conversation along without making me feel rushed. Mr. Ilir Ikonomi pieced together a nice promotional movie clip in advance of the broadcast. Two whiz kids behind the scenes, Julian Zyla and Festim Gashi, made sure everything went smoothly. I am sure there were others involved that I did not get a chance to meet. I was particularly impressed that within minutes of the interview, content flowed from live TV to video clips on YouTube, updates on the Website and posts on Facebook and Twitter. A truly modern media operation for which you and the Voice of America should be proud. Now, as in the past, VOA Albanian Service remains the gold standard that other Albanian media operations try to emulate. Here's a link to the video (in Albanian). The transcript of the interview follows. Ms. Dervishi/VOA: A new book by Albert Lulushi, titled "Operation Valuable Fiend" is expected to be published in 2014 in the United States and Albania. The book recounts the efforts of the Central Intelligence Agency, CIA, to overthrow the communist regime in Albania in the early 1950s. It is known that these efforts failed, but why? The communist regime in Albania trumpeted this failure as its own victory, whereas Nicholas Bethel made the case in 1984 that the American operation was betrayed by the superspy Kim Philby. Without rejecting these claims, Lulushi has taken a deep dive into the details of the operations and describes all the elements that contributed to their failure, based on a trove of recently declassified CIA documents about the operation with the code name BGFIEND. Like many Albanians of my generation, I learned in the communist schools the version of the story pushed by the government propaganda. When I came to the United States, I read Bethel's book and for a long time I found his arguments satisfactory. Then, about a year ago, I was searching in the National Archives and I noticed that the CIA had declassified a large amount of operational documents about the activities they conducted between 1949 and 1954. Reading these documents, I realized that the full story of these activities had not been told and it had not been presented in its entirety to the American or Albanian public. What was then the operational plan of the CIA? At the beginning of 1949, a very good opportunity existed for the CIA to topple one of the regimes under the dominance of the Soviet Union. This was Albania. At the time, as you know, Tito had broken away from the communist bloc. Albanian continued to remain under the Soviet influence, but it was physically isolated and unable to receive reinforcements from Soviet troop should an upraising against the communist government occur. At the same time, the CIA had expanded its mission. Until that time, its role had been to collect, analyze and disseminate intelligence on foreign countries to the decision makers in the executive and legislative branches of the U.S. government. The role of the CIA was expanded in 1948-1949 to allow the Agency to conduct paramilitary operations. A new organization was stood up within the Agency to execute these operations, headed by Frank Wisner. They saw in Albania the opportunity to prepare their first paramilitary operation, which they began to plan and execute in 1949. How well was the plan prepared? 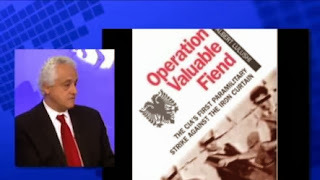 Theoretically, considering all the aspects that were taking into account, I can say that the operation was prepared in thorough details, from high-level actions, such as organizing the opposition outside Albania among anti-communist émigrés in Italy and Greece, and down to details, such as planning to offer $500,000 each to Mehmet Shehu and Enver Hoxha for their defection in place and promise not to use the Albanian army to oppose the operation. However, a number of these planned actions remained at the planning level and were not implemented. This topic remains fascinating even after all these years. British authors have advanced the hypothesis that Kim Philby, the Soviet mole inside the British Secret Intelligence Services, informed the Soviet about these plans, which is how the communists in Tirana knew about them and were able to fold them. Does your research support of weaken this hypothesis? In my opinion, Philby's betrayal was not the main reason for the failure of the operations. I say this for several reasons. First, although this was a joint operation between CIA and SIS, by virtue of how operations of this kind were conducted, there was a separation between the two services and operational details were not shared. So, even though Philby had knowledge of the high-level strategy and objectives of the plan, from the operational perspective, he did not know the locations or times where the American agents were dropped. Next, the majority of the agents captured or killed in Albania were sent by the Americans; the British agents in general were able to exfiltrate without falling into Sigurimi's hands. It is natural to think that if Philby sabotaged these operations, he would sabotage the British as well as American operations. Lastly, the deepest losses for the Americans occurred after Philby was recalled from Washington to London, where he was forced to resign from SIS under suspicion of being a Soviet spy. This happened in spring/summer of 1951, whereas the most spectacular losses of the Americans came between 1952 and 1954. After these operations ended, were there other efforts to overthrow the communist regime in Albania. I don't believe there have been active efforts. I say this because one of the important lessons learned from this operation by the political establishment in Washington and the CIA was that it was very hard to overthrow an already-established regime in Eastern Europe. CIA shifted its attention to the Middle East, where they organized the 1953 coup in Teheran, and then to Latin America, where they conducted the 1954 coup in Guatemala. From the perspective of that time, these two operations were successful in that they accomplished their most immediate objectives. The conclusion, then, was that it was better to direct the efforts, experienced agents, and lessons learned from the Albanian experience to the Middle East and Latin America. These same agents and experience were also used to plan the 1961 invasion of Bay of Pigs in Cuba, which, as we know, was a disaster. Beyond its historical value, what other benefits do you think your book will bring to the Albanian society and politics? This is a very good question. These events, indeed, occurred over sixty years ago. My book recounts the history as it happened, based on facts and documents, and without subjective interpretations, which will be valuable for the Albanian society. Looking at the events from a broader perspective, one of the main reasons why the operation failed, was that the Albanian anti-communist forces were unable to create a united front of opposition against the communists. They were not able to speak with one voice to their American sponsors. If you look at the more recent history of the war in Kosovo, the Albanian politicians were able to create a united front when communicating with the American and the Europeans. This enabled them to ultimately achieve their objectives. Thus, the lesson for the Albanian political class is that when it comes to representing the national interests in front of the international community, they need to leave behind the differences and narrow political interests that dominate the internal politics. Thank you very much for coming in our studio today. It was a pleasure and I thank you for your thoughtful questions.